Plasma Ball -7.5 Inch - Nebula, Thunder Lightning, Plug-In - For Parties, Decorations, Prop, Kids, Bedroom, Home, And Gifts - By Katzco. 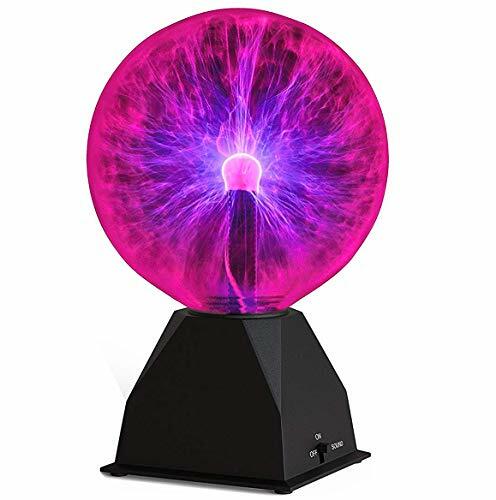 Look no further than Katzco's Light up plug in plasma nebula ball. This 7.5 Inch plasma nebula ball is great for decoration. Put in your room, living room, office, or anywhere to create a super cool science like atmosphere. Can be easily placed anywhere. These Plasma Nebula Balls are great for using when you are throwing a party in any space. Can be easily and conveniently placed wherever you want. Just plug in, turn on and create an awesome atmosphere anybody will love. Katzco's Plasma nebula balls can also be used a prop for photos, videos, plays, and other types of creative performances. Pretend to be a mad scientist with this ball! Kids will love seeing what happens when you touch it!. Plasma nebula ball comes with an included 6 foot plug in cord that way you don't need any batteries that will die out on you. Plug ensures the ball will keep the party going until you are finished. Plasma Ball is super interactive. One switch-position provides a touch-sensitive show of multi-color light. The second position produces a mode that's completely dependent on your manipulation, as far as touch and sound. Simply put, it reacts to you; your voice, your music, and your hand. Spend your money for the good ones, Katzco will get you satisfied get yours today. Try it, totally risk free! just send a simple email and you get a full refund!